This article, originally published in July 2013, was the winner of a 2014 Visit California Eureka! Award for travel writing and multimedia. Congratulations to Michelle McCoy (author) and Janel Murray (video editor) for this awesome recognition. Gold! Gold! Gold from the American River! We crammed a trip to Sacramento and Gold Country into two days and tried to hit all the highlights of California history, plus, we tried to strike it rich on a gold dig. We didn’t find much gold and I even got a parking ticket, but we found lots of treasure. My kids wouldn’t really call visiting historical sites “treasure” but I knew they were. Everything we had read about California history was there, preserved in Old Sacramento and in the sleepy towns of Gold Country. We panned for gold and found a few flakes, but it was the time we spent playing in the river, walking around Sacramento, and laughing together at our adventures that was the true treasure. We were together. Just about every 4th grader in California hears the old stories of how gold was discovered in a little ditch off the American River way back in 1848. Thankfully a football team (the 49ers!) helps us all remember the year that thousands flooded through the gates of San Francisco. Most of those explorers came sailing up the river from San Francisco to Sacramento to make their fortunes. So, we started there too! Old Sacramento is a five block section right on the banks of the river where history comes alive. As soon as we walked under the 5 freeway overpass, it was like we had stepped back in time. “This is what a boardwalk is, kids!” We found a large collection of historical buildings and several great museums. When we walked into the Old Schoolhouse Museum my kids sat down at the desks and started writing on their slates. My kindergartner sat in the front and wrote his name while my 4th grader sat in the middle and copied the old “Pledge of Allegiance.” A volunteer schoolmaster led in a class of 30 students and we moved to the back while she taught them a lesson like a schoolmaster would in the 1850s. I smiled every time a student rose to answer a question and curtsied or bowed before answering. Let’s bring back the respect and manners of the “good old days!” We could have spent the whole day in Old Sacramento with taking a one hour historical river cruise with Hornblower Cruises, or visiting the California State Railroad Museum (a favorite for kids! ), or the Sacramento History Museum, but we were off to the State Capitol for a tour. There is something about a state capitol with Greek colonnades and a large dome that makes me feel so patriotic. Perhaps because it has been used as a symbol for freedom for centuries. The California State Capitol is beautiful on the outside and I was as excited as an old-fashioned school girl to see the inside. We signed up for a free tour, but because there were several school groups there, we had to wait for an hour. The documentary on the reconstruction of the capitol plus the gift shop kept us occupied. During our 30 minute tour, we heard the unvarnished history of those who lived in California through the centuries. We sat in the galleries of both the senate and the assembly and then stood outside the actual office of the Governor. The Governor! I was excited to be that close to the Governor’s office, although the kids were paying so much attention to the statue of a grizzly bear that they didn’t even realize where we were. My 4- and 6-year-olds were lying on the floor by the end of the visit, and I was sure other visitors were bothered by them, but this is a free country, right? The whole visit was great until I found the parking ticket on my front windshield. I learned it pays to move your car after one hour and actually figure out how to pay for a parking decal. I had some problems with it apparently! TIPS: A great place to stay in Sacramento is the Residence Inn Downtown at Capitol Park. We slept in a large suite (with separate bedrooms!) on the 8th floor with a great view of the outdoor pool, which we also enjoyed. It was a 2-3 block walk from the Capitol and was in the heart of downtown with great restaurants (we loved The Old Spaghetti Factory), museums (California State Capitol Museum), and entertainment (IMAX Theater) nearby. MORE HISTORY IN SACRAMENTO: There are over 30 museums in Sacramento that have amazing collections of history, art, and kid-friendly fun. Check out Sutter’s Fort State Historic Park, Crocker Art Museum, California State Capitol Museum, or the Aerospace Museum of California to round out a historical trip to Sacramento. The next day we headed out of town directly east to Gold Country. Placerville was the “big” town we were headed for, previously known as “Hangtown” for its wild history… including several hangings, but better known for its rich vein of gold and for being a main stop on the Pony Express. We happened to like the playplace in the McDonalds right off the freeway. Just north of town is Gold Bug Park and Gold Bug Mine. Most of the time I think of miners panning for gold on the banks of the river, but in Gold Bug Mine, the miners blasted it out of the rock. We took a self-guided audio tour into the drift (aka “shaft”) of the mine where we could see evidence of the quartz vein that the miners followed and extracted for the gold it contained. The big thrill was when three sharp whistle blasts sounded and then all the lights went out. My kids stopped in their tracks and we all were shocked at how dark it was. We couldn’t see our hands in front of our faces! Back outside, we took a short trail uphill to the stamp mill. This was the very large machine that stamped the ore into tiny pieces in order to get the gold out. A blacksmith took us on the tour and showed us a working model of the stamp mill. The real one must have been deafening to hear! 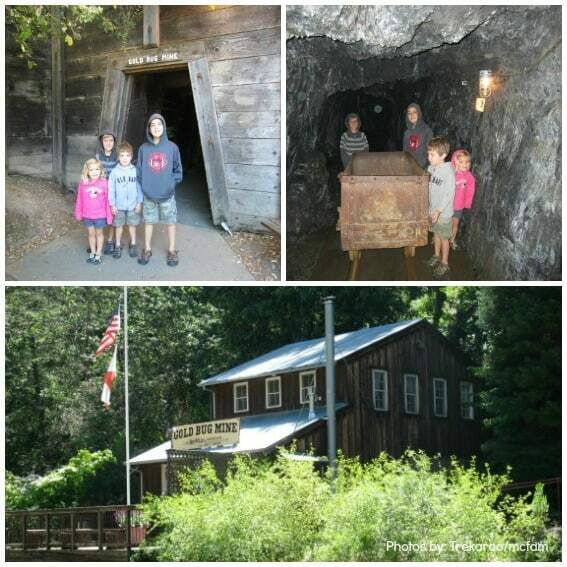 Coloma was our next destination and I figured it was the best place to go to really understand the gold rush. Why the best? Because it was there that the very first gold nugget was found. Mr. Sutter built a saw mill on the river in order to cut logs. As his partner, James Marshall, was digging out the ditch for the mill, he found gold. The whole course of history was changed in that one moment! The Marshall Gold Discovery State Historic Park has preserved Sutter’s Mill, James Marshall’s cabin, the gold discovery site, a Chinese store, and several other historic buildings. We started at the Visitor Center and then headed to the gold panning area. I handed over the $7 fee per person, knowing that it was the only large amount of “gold” I’d see that day. My boys spent the next 45 minutes sifting through the gravel and sand and really learning the backbreaking work of panning for the heavy flakes of gold. They figured out how to find a couple of pieces but quickly learned that most miners didn’t get rich quick. That $21 was worth it! We walked the forested trail along the river and saw the restored mill and the stone marker for the original site of the mill. 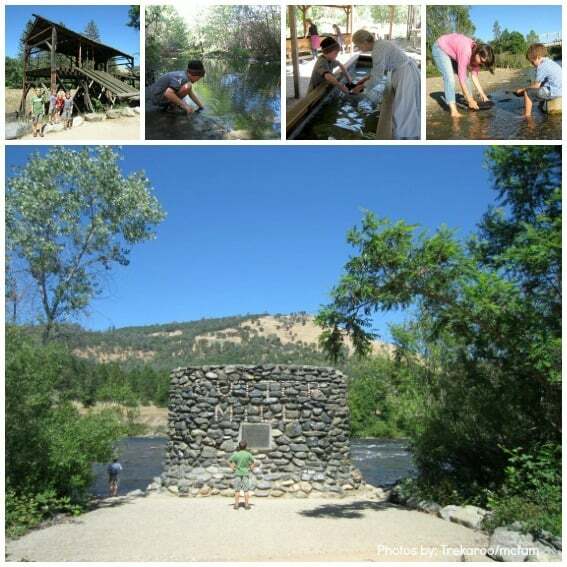 My kids mostly enjoyed the rock throwing contest we had on the banks of the river and I was happy to take a break from all the “history learning.” Visiting here was like seeing all the part of the Gold Rush and the stories that happened all in one place. TIPS: I would love to recommend staying where my family stayed, at The Coloma Country Inn Bed & Breakfast right next to Marshall Gold Discovery State Historic Park, but sadly, the Bed and Breakfast has closed its doors. Our friends at the El Dorado CVB recommend staying at the Coloma Resort which has different lodging options for a variety of needs, including tent camping. The Gold Country of California stretches from north of Sacramento way down south to Mariposa. Travelers can spend a week or more visiting all the small towns, gold mines, and great museums, but we found a way to get it all in in two days. And if you are curious, yes I homeschool. Yes, I love it (at least, some days). And yes, you should take your kids to Sacramento and Gold Country after they study California history. It is the perfect field trip that brings it alive! 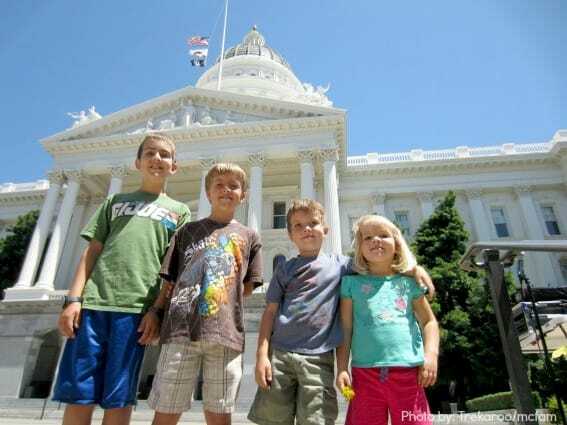 TIPS: During the spring months of the school year there are lots of school classes on field trips in Old Sacramento, the State Capitol, and in Gold Country. For families traveling to the area, it may be best to visit other months for a less crowded experience. Bret Harte’s Gold Rush – a collection of short stories by Bret Harte. Follow Trekaroo Family Travel’s board Road School: American History -Western Expansion and Pioneering on Pinterest. Disclosure: The Sacramento CVB and El Dorado CVB gave me amazing trip itineraries and arranged our complimentary stay at the Residence Inn and Coloma Country Inn B&B. Both CVBs offered great suggestions of museums, white water rafting tours, and more that sounded like so much fun! We were short on time, but any other family would find great trip ideas by contacting them. I was not asked to express a particular point of view and all opinions are my own. Love this post! I’m definitely gonna be using these suggestions this year as our eldest begins learning about CA History. Thanks for all the book suggestions as well. I’m excited embark on this historical journey with the kids. You have a few factual errors you should correct. Gold seekers came up the SACRAMENTO, not the American river from San Francisco to Sacramento. The American flows into Sacramento from the Sierra to the East. Secondly, the bear outside Governor Brown’s office is carved wood, not brass. Locals refer to it as ‘bacteria bear’ due to the thousands of dirty hands that caress it daily. Governor Schwarzenneger purchased it and donated it to the state when he was in office. Finally, Sid Fleischman’s wonderful book is By the Great Horn Spoon. There is no such thing as a horned spoon. A horn spoon is a scoop fashioned from an ox horn used to scoop gold bearing sediments during prospecting. The title of Mr. Fleischman’s book was a 19th century miner’s expression of surprise or astonishment. Thanks for your factual corrections, Paul. Corrections have been made to this blog article, but it is interesting to note after further research that the bear outside the Governor’s office is neither brass nor wood, but bronze. It is easy to see how discrepancies can be made as I am just a real parent taking my kids on a field trip of sorts. And as a further note to parents, that bear has been nicknamed “bacteria bear” because of all the people who touch it, so perhaps some antibacterial gel would be a good thing to have in your bag for little hands! I live in Gold Country, and get to see this history every day. As a storyteller & retired teacher, I’ve enjoyed finding creative ways to teach our area’s rich history. In the next two months I’m releasing a new CD: “Traveling Up Gold Mountain: Songs & Stories of the CA Gold Rush Era.” I’ve been working with music historian Peg Reza and several other talented musicians from our area. The CD will be well researched and lots of fun. Watch for it! !